This blog entry about the events of Friday, June 29, 2007 was originally posted on August 01, 2007. I was still in awe of these Alpine peaks every time I looked out our dorm’s window at the Backpackers Villa Sonnehof. The hostel, a former chalet for Swiss elite and former retirement home, was a great place to set up home base for explorations in Interlaken; not only did it have a winning mountain view, but had many homey amenities: a backyard for kids to play soccer, a small theater room to watch DVD movies at your leisure, internet stations, and a “meditation room” with a piano. (I opened it and played a familiar melody: the first eleven notes to “The Sound Of Music.”) Being in a six-person shared dormitory room wasn’t too shabby either for Stephanie and me, even on our romantic “fake honeymoon;” we did manage to get some alone time together in the afternoons when our dormmates were out and about. We’d see them at night of course, and I realized that many of them were sort of similar. “How do you like being in a room full of dorky Asian guys?” I asked Steph. “But you’re my favorite dorky Asian of them all,” she told me. Amongst the dorky Asian guys was this one hyper backpacker from Hawaii who looked to me for some direction in his life. “I’m an idea man! I got all these ideas, man!” We swapped e-mail addresses, but haven’t made any correspondence. ONE OF THE TO-DO’S in Interlaken is to see how real Swiss chocolate is made at the Grand Restaurant Schuh. Behind the walls of their shop and dining halls is a secret room in the back, used for the “Chocolate Show,” hosted this time by a Swiss woman from Zurich named Martina. Steph and I — along with two old women from Michigan — watched the somewhat overpriced demonstration on how cocoa beans are processed and made into the chocolate we know today. The chocolate spectrum goes from white to dark, and I was fascinated to learn that milk chocolate was created by accident; someone had accidentally used Nestle powered milk instead of sugar or something. Martina was actually a graduate of a chocolate making program where final projects can be as artful and elaborate as they are sweet. Not surprisingly, we were given the opportunity to help make chocolate, and both Steph and I agreed that the best part of it was sampling it, particularly the dark chocolate. As Swiss an institution Schuh is, their “Grand Restaurant” is grand enough to host the big Japanese, Chinese, and Korean bus tour groups that come into town, and prepares and serves their cuisines respectively, for the masses (and the individual diner too). That is not so surprising in an interntional neutral country like Switzerland; many ethnic cuisines are available, including a Hooters (yes, a Hooters), and Mexican food, a cuisine Steph didn’t believe would be in Interlaken — I won a bet between when we found it (I knew any backpacker haven has at least one). However, we skipped out on dumplings and burritos (despite a Swiss Italian woman’s claim that “It’s suberb! Superb!”) and kept it real Swiss: radler beer cocktails, pints of local Rugen bräu, wiener schnitzel (finally! ), and of course, different kinds of fondues — cheese, meat, and chocolate — to continue “that 70s part of the trip” at the outdoor seating area of Schuh with its very 1970s-looking water fountain. ABOVE ANYTHING ELSE that Interlaken is known for, it is that the town and its environs are a playground for adventure seekers, adrenaline junkies, and outdoor enthusiasts — in fact, when were there, Toyota was hosting the extreme Outdoor Games in the adjacent town of Unterseen. Like the time I arrived in Cape Town, South Africa, I was overwhelmed with the amount of activities that were readily available in Interlaken (minus great white shark diving): hiking, mountain biking, Zorbing, canoeing, rafting, climbing, spelunking, and most noticeably, paragliding — paragliders in the sky are as commonplace as birds. With only two days allotted to play in this Swiss adventure park, Steph and I skipped out on all of those activities and went for the singlemost extreme (and most pricey) activity Interlaken could muster up: skydiving out of a helicopter hovering over the Top of Europe in the Swiss Alps. For us it would be — for the sake of another pun — a way to really “end things off on a high note” before splitting up after Switzerland. You may be surprised to know that skydiving was a first for both of us (plane or helicopter), and we were psyched for it at breakfast that morning as Wham’s “Wake Me Up Before You Go Go” appropriately played on the speakers of the TV weather report. Steph and I sipped coffee as we went down a sort of checklist from the brochure for Skydive X-Dream (another pun). “Are you ready to jump from twelve thousand feet?” Steph asked me. “That’s a good height,” I answered. “After this trip, I hope not.” With all the rich pasta, meats, chocolates and cheeses we’d been eating since Italy, we reckoned both of us had probably gained at least ten pounds each. Soon, Alexis, a woman originally from Long Island, NY, picked us up in an officially-painted Skydive X-Dream van. Despite her being stressed out from misplacing the only company cell phone after a night of boozing the night before, she managed to drive us down a mountain road to the nearby town of Lauterbrunnen, where their base of operations was. There, we watched a sample of the skydiving video they could produce and sell to us after the jump, created in less than an hour by a funny and energetic Dutch guy named Koos, manning a Canon mini-DV camcorder and an iMac. I was actually impressed with the video — usually they can be pretty cheesy — with its build-up and nice choice of music (“Jump” by Madonna) and I was sold, especially since I could use it to grab pictures for this blog. Koos was my tandem partner anyway, so it made things easy. “Welcome to the valley… of adrenaline,” Koos told me, all ominously, but with a goofy smirk that I’ve noticed on many Dutch people. “You guys got a beautiful day,” Alexis told us, who had no trace of a Long Island accent. Blue skies were a recent novelty in those parts; the region had had an unusually rainy June. The time for our jump was approaching and Steph and I were bursting with excitement. 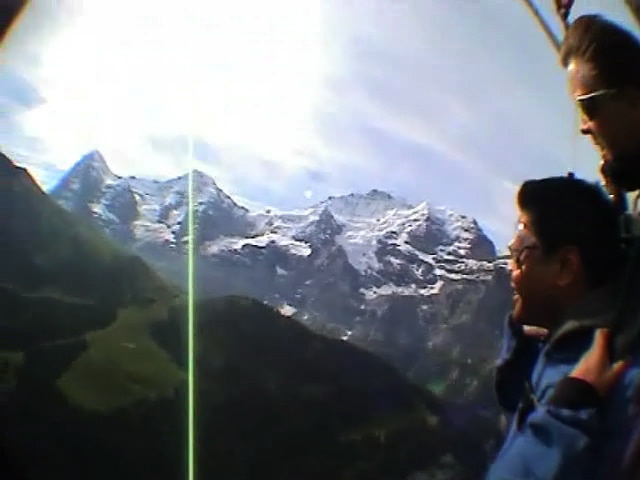 After a short drive through the breathtaking valley of adrenaline — breathtaking, even at ground level (5,000 ft. ASL actually), with its narrow waterfalls shooting off the cliffside — we arrived at the Lauterbrunnen heliport. We geared up into jumpsuits and strapped into our harnesses — for me and Koos, it opened the door for harmless gay innuendo jokes; for Steph, it was an opportunity to pretend she’d had a nasty spill. “This [skydive] is something I tell my mom afterwards,” she told me. For the video, Koos quickly did an on-camera interview of the two of us out on the helipad. KOOS: You guys on a holiday? KOOS: How do you like it so far? KOOS: Or, is it a little bit borrrring? ERIK: That’s my safety harness. ERIK: For falling down to the earth from a very high altitude. KOOS: Oh, you’re gonna jump out of a… what is that? KOOS: Out of a helicopter? To make your holiday more exciting? Koos lifted his camera with the fish-eye lens to reveal the big “H” we were standing on. KOOS: Well, maybe you can tell me what that big H stands for. We laughed; the Dutch really know how to get a great smile out of people. Because of a tight schedule with helicopter availability, we almost immediately boarded the helicopter, but carefully. At the last minute, Steph’s tandem partner Mike showed up after being stuck in traffic from Zurich — we hoped he knew what he was doing because he seemingly came out of nowhere and looked a bit frazzled. Not that anxious fear of jumping out of a helicopter was on our mind; we were too busy with the view in front of us. The helicopter quickly ascended up, higher and higher through the valley. The front of the cabin was an almost complete glass dome, which was perfect for the panoramic views in front of us. The higher we went, the more snows of Jungfrau were revealed, and soon we were at the level with the peak, at around 17,000 ft. above sea level, surrounded by the incredible Swiss Alps. Down below were the checkerboards of fields and tiny specks that barely resembled houses. The time was upon us. We got the go-ahead from everyone: the pilot, Koos, and Mike. Steph and I couldn’t stop smiling at the situation, even sitting in our respective partner’s laps, strapped in tight. Unlike a being in a plane, in a helicopter you’re just suspended there in air, high up in the stratosphere with no obstructions or turbulence; it was like being on the platform of a really tall, motionless building. Unlike a freefall with bungie jumping, where the impact with the ground is potentially so suddenly gruesome, the freefall from 12,000 ft. is actually quite fun. There’s no immediate threat of death, and all the wind pressure coming at you at 120 mph feels like a cushion. You’re so high up you don’t even realize that you’re falling — falling really fast — and you forget the fact that if you weren’t connected to a parachute of some sort you’d be liquified. I enjoyed every moment of it from the sensation of “flying” in a 42-second freefall, to the slow and peaceful descent after the parachute had been deployed. Words can not describe the views of the mountains in front of me (picture above); I couldn’t stop smiling. “This is amazing. It’s so beautiful,” I said. I’d cheered on Steph when I saw her fall out of the helicopter — although she probably didn’t hear me with all the wind noise and all the laughter coming out of her mouth. Gradually the two of us soared down the “valley of adrenaline,” down passed the peaks, the glaciers, and the waterfalls, and landed on our asses in the grassy field near the heliport. Steph’s British tandem partner Mike taped us for the post-interview. ERIK: The brochure said that we’d have the best experience of our life, and I think it might be. STEPH: Yeah, I think so! MIKE: You sound like you’re really considering that. ERIK: We travel a lot too, so it says a lot. STEPH: We were making fun of it before but yeah. MIKE: Hey listen. Welcome to skydiving. Welcome to Switzerland. I hope you had fun, and hope we’ll see you again! Mike’s closing words weren’t actually his final words; his eyes lit up when he found out the two of us worked in advertising and wanted us to help him out. We thought he just wanted a freelance interactive gig like mine in New York, but it turned out he had this whole spiel about how he runs his own skydiving video internet streaming business, RealXStream, and needed a partner to align with. We did the best we could to help him out — he was a real noob at business — and in return, he hooked us up with free video streams of our jumps (an abridged version of Koos’ iMovie DVD), valued together at about 100 Swiss francs. The talk of business was trivial compared to what we had just done just a few moments before. “We just jumped out of a helicopter!” I exclaimed to Stephanie later on when I was still on my high of it. No longer a skydiving virgin, I was glad to have done it the first time with someone special — and by that I mean Steph, not Koos. IF THERE WAS ANY WAY to top skydiving out of helicopter over the Alps, it had to be in a much quieter, less extreme, and very romantic way. For our last dinner together before splitting up the next day, we decided to have a picnic with groceries we got at the local grocery store: freshly cut sharp Swiss cheeses, different kinds of Swiss ham, fresh Swiss bread, and a nice bottle of Swiss wine — easily opened by the corkscrew of my Swiss army knife. We rode our bikes out of town to the lakeshore of Lake Thun where we found a quiet shady spot. To make the moment even more special I had an announcement. “You know what I’m going to do for this moment?” I said. “I am going to actually put my cameras away.” It was a big deal because basically the entire time we’ve been together, I’ve been a complete shutterbug, disrupting romantic moments with clicks of my camera. She was shocked but impressed at my gesture, although she asked me once to take it out again to take a picture of a lone oarsman for her sister Lizzie. In the end, it was another one of our perfect moments; a true ending on a high note, and without a pun. It was just us together by the lakeshore with a lovely meal and the majestic mountains surrounding us in a romantic, almost magical light mist. All of it was epitomized by an ultimate photo of us — a picture that I’d taken with the self-timer before I put my cameras away — a picture perfect silhouetted kiss. THE NEXT MORNING we were awake at “stupid o’clock” to get the first train out of Interlaken to Basel — a sleepy two-hour train ride — where we caught our mid-morning ride to London’s Luton airport, on a cheap easyJet flight. Not surprisingly, it was raining in the U.K. when we landed and immediately rode to the train station after claiming our bags. “You know I really don’t mind the rain,” Steph told me that gloomy morning. “It’s time.” True, we had lucked out on good weather our entire time in Italy, Croatia, and Switzerland. “I think if you’re here, it should rain,” I said. Perhaps it was poetic that it was raining at that place and moment because it’s where and when we parted ways. Stephanie headed to the platform of the northbound train to visit her friend Mike in Nottingham for one or two days (it hadn’t been determined yet). I went to the platform for the train headed south towards the city to meet up and stay with Londoner Zoe (whom I met and traveled with in Bolivia if you diehard blogreaders recall). Stephanie and I kissed goodbye, or rather, a see-you-later. “So I might see you tomorrow night then?” I asked her, knowing she had to pass through London to take the EuroStar to Paris, to catch her flight home back to the States. ONE MORE ENTRY LEFT… Stay tuned! What a tease! Your announcement….I really thought that it was going to be something a lot more personal like a proposal!! You two make a great pair. Loved the skydiving video as it is something I have always wanted to do. Looking forward to the next entry. ROSE: Ha ha ha… Yes, a tease. Read the next entry; we’re not ready for that yet. ugg boots sale ukfree shipping,sale online. years,free shipping, super sale off retailing with 1 week delivery to your door.